I’m a crumb topping addict. Crumb bars? Yes! Crumb cake? Please! Crumb covered pie? Heck yeah! Over the past 3 years I’ve tried a substantial portion of Four & Twenty Blackbirds’ menu, but the other day I noticed a pie that was new-to-me: Rosemary Shoo-fly. Naturally I had to give it a try . . . 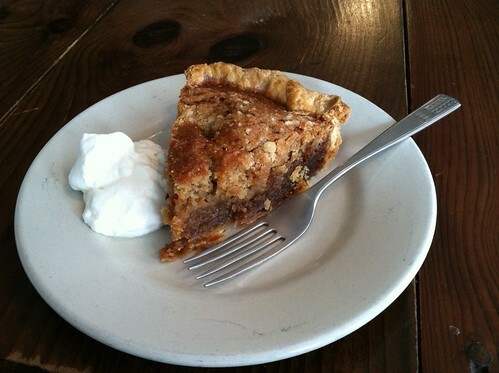 I first fell in love with Shoo-fly Pie on a trip to Amish country when I was seven. For years I’ve had an unrequited love affair with Pecan Pie. But with a nut allergy, actually tasting a slice is unfortunately not in the cards. Though Shoo-fly Pie isn’t quite a direct substitute, this crumb topped, sweet yet earthy, molasses-filled pie is a mighty good option in my book. I learned to make Shoo-fly at home from my Mennonite college roommate, who shared her family recipe with me. Traditional and easy-to-make, it’s comfort food pure and simple . . . leave it to the Elsen sisters to kick it up a level. I’ll admit I would have never thought of adding rosemary to shoo-fly, but it works. It really does. That little bit of savory balances out the sweetness of the pie perfectly. I'd like another slice...like right now...please. The menu at Four & Twenty is seasonal, so Rosemary Shoo-fly won't be available once spring rolls around, so get your fix now! I'm a crumb topping addict. Crumb bars? Yes! Crumb cake? Please! Crumb covered pie? Heck yeah! Over the past 3 years Ive tried a substantial portion of Four & Twenty Blackbirds menu, but the other day I noticed a pie that was new-to-me: Rosemary Shoo-fly. Naturally I had to give it a try.